2014 was a year of vindication for me in that a lot of the opinions I had towards game mechanics and design were similar to directions CCP took with various decisions. For example, ISBoxer input proadcasting, improving the in game map and fitting window, capital ship jump range nerf, ship skinning being expanded, etc. I like to think that CCP game designer and I are at least on the same wavelength in terms where the game is going and should go in the future. So I'm going to roleplay a little bit and pretend that I've been asked to map out the overarching design for the "new space" that is eventually coming at the end of the roadmap we are all so familiar with. First, let's define some base concepts that any implementation has to meet. 1. Widely Accessible - What I mean by this is that the new space content added to the game can be experienced by young or older players and solo to small groups to large groups. All current regions of space meet these requirements to various degrees or another; w-space has class 1 wormholes for the newbies and class 6 for the larger experienced groups. NPC null sec offers opportunities for small groups while player owned null sec is the domain of larger groups. Etc. 2. Does Not Detract Adversely from Existing Content - The new content added should expand the game but not at the expense of severely damaging or replacing other parts of the game. Some adjustments to economic or player density in the short term is the be expected, but it should not be drastic. 3. Involves Player Built Stargates - Its an iconic act in the current EVE universe that players cannot participate in. Players can build starbases, outposts, ships, modules, empires, jump networks, but not fully functional stargates. One could argue that the jump bridge networks do cover this already, but I would argue that they are cumbersome in that they require an operational POS, sovereignty, system upgrades, fuel, etc... but the new implementation should be more robust and operate similar to normal stargates. 4. Utilizes The Current Game Lore and Moves it Forward - This is less critical than the other points but I think we can all agree that the dynamic lore and increasing mysteries over Caroline's Star, Circadian Sleepers, Unidentified Objects, etc have energized the player base and we should continue to push that direction with any new content. 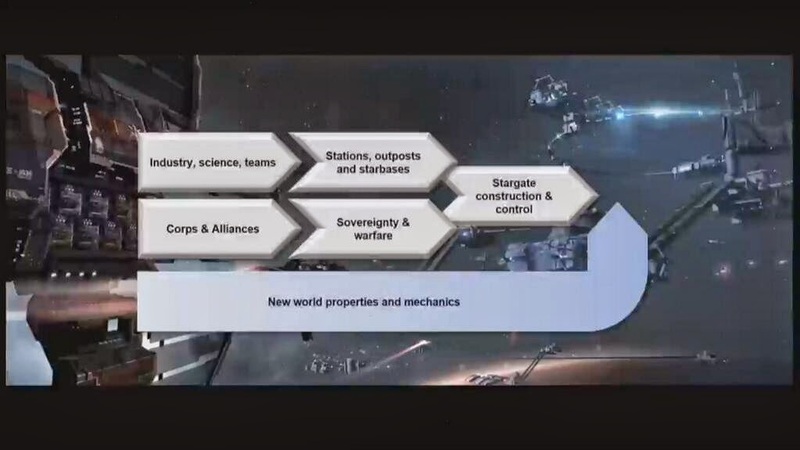 With those axioms stated, let's see what logical design decisions we can come up with as if we were in charge of EVE Game Design in this regard for this big push over the next year. The new space will be centered on existing Jove space (three regions) with three other previously unmapped regions added to the cluster. All normal stargates in these 6 regions will be removed or never existed. These unconnected system will allow wormholes to spawn in them as whatever Jovian tech was dampening wormhole spawning has failed as the Jovian civilization has completely collapsed and become desolate. We don't want to devalue wormhole space or null sec so within these regions there will be new resources to be harvested collectively referred to Jovian Remnant Tech which will be found in special sites that are scanned down using the usual probes and accessed via the usual code breaking and salvaging mechanics. These sites will be protected by new Sleeper rats in three regions and Sansha incursion rats in the other three (that have come to harvest the remnant Jovian tech themselves). The new space will have true sec levels like null sec and wormhole space so some areas will have a smaller risk-reward equation than others. It will operate similar to wormhole space in that there is no local, but since it will be within range of known space systems you can light cynos in the Jovian systems... but it will attract a severe NPC response. The new Jovian Remnant Tech will be used for two purposes: first, it will be required to reverse engineer blueprints for the new stargate components, and second, it will be required in the construction projects of these new stargates. There will be three sizes of stargates: Large which will allow all sizes of ships, medium which will allow battlecruiser and smaller, and small which will allow destroyer and smaller. Stargates can be built in any non-high sec system regardless of sovereignty but have to be paired with another same sized stargate within range (7.5 AU for large, 5 AU for medium, 2.5 AU for small). Player Owned Stargates (POSGs) are owned by the corporation and are built up in place in space from several components built in factories from reverse engineered blueprints. Once completed they are merely "anchored" and not "online" until they are actively paired at both ends with a second stargate within range. Once online anyone from that corporation or its parent alliance or with positive standings can utilize the stargate as long as they fit the size restrictions. Stargates, however, can be hacked by other non-friendly parties to made available for any appropriate sized ship for a period of time. Once paired and online either end can be voluntarily put offline (which automatically puts the other end offline) and the owning corp can put it back online to the same or different endpoint as long as all other conditions are met. Stargates can be attacked and put into reinforced mode much like POCOs during which time they are offline, and after reinforcement they can be destroyed. Their hitpoints will scale with their size with the medium ones being like IHubs in terms of hitpoints. Yes, these new stargates can be built to go from one known space system to another as well as the obvious use case of to Jovian space systems. I feel that as long as they are directly attackable, hackable, and destructible it adds to interactions in space instead of detracts. Also note that once online they become visible on the overview from anywhere in the system, and in Jovian space they activate local chat to become immediate like null sec instead of delayed like wormhole space. In the Jovian space there will be no or few NPC stations, and new outposts will not be able to be built although POSes (or their eventual replacement) can be anchored, as well as stargates can be built here. How's that for a first pass?